The government of Zambia has given a waiver to China’s Jinchaun Group to take over Chibuluma copper mine without putting up a mandatory offer which would have seen the new owner buy off shares held by the Zambian Government and other minority shareholders. 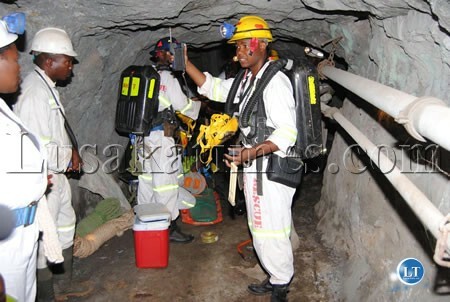 Chibuluma mine is owned by South African-based and JSE-listed Metorex Limited, which is in the final stages of being taken over by the Jinchuan Group. In a statement jointly signed by the two parties, they said the Zambian Government had unconditionally and irrevocably consented to the completion of the scheme of the arrangement. The statement said the Ministry of Finance and National Planning had also waived its rights to require Metorex to acquire its special share interest in the Metorex business over Chibuluma Mine, in which government holds a 15% stake through the ZCCM-IH. “As a result of having obtained the mandatory offer waiver, Metorex is able to formally approach the Zambian Securities and Exchange Commission (SEC) to obtain an exemption from any obligation to make a mandatory offer to minority shareholders of Chibuluma in accordance with the SEC regulations,” the statement said. Exemption from the SEC from making a mandatory offer and securing consent from the People’s Republic of China are the only two steps left before the deal is concluded. With regard to the Chinese government consent, last month Jinchuan Group reported that progress had been made towards getting approvals and consents from the relevant authorities. “Application documentation has been formally accepted by the relevant authorities, and Jinchuan advises that it believes the process is progressing well, and anticipates receiving the relevant approvals and consents in due course,” Metorex said. Government policy allows men to give emotional support during labor in the labor ward. Can the legal minds explain what is going on. Where Wyber Simusa Mines Minister and his PF coz this whole arrangement started during MMD’s regime and they are now sealing it. What are their comments on this matter. This thing is happening within 90 days of PF assuming power and feting the Chinese at State House recently. Has th govt got some and been put in Chinese pockets. There are many questions than answers. Give them another dinner at state house. So the pf government reneged big time on kicking out the chinese.Now they are getting more mining rights and more mines.When will Zambians be able to run mines?we need more programmes and finance so that we can run these mines.Hostile take over wont help.Does pf have the muscle to begin a mining revolution?Time will tell.GOD BLESS ZAMBIA. Thes small people are corrupt and rich, they get what they need anywhere. Sata was talking from a distance during campaign now they are dinning together will he remember they have to align themselves with the labour laws of Zambia ? Naaaa, ask RB they are hard nuts ! We just have to ensure that they are good corporate citizens, good investors who treat their employees well and abide by the country’s labour laws. Sata you seem to be embracing the chineese just like RB. I voted 4 you coz u toked cinvincingly against them. What has changed? Come 2016, you are going. So disappointing. Having read this article, I am not sure where some of the comments above are coming from. In short, the statement says that shares in the mine is being sold by Metorex, and the government had the option of asking the chinese company to purchase the 15% held through ZCCM IH, but they did not, meaning that ZCCM IH will retain its shareholding. The government gave approval to the deal because the major shareholder wanted out, and a buyer was willing to meet the asking price. Anybody know about the new framework of exporting copper that the new administration was supposed to come up with? Remember they wanted to halt all trade in metal exports until a report had been produced but backtracked a few days later after an outcry? I doubt if any deals with the Chinese under PF Govt. are deemed progressive by the public. All this is because of Sata’s sudden U-Turn. Let’s not forget Sata’s harsh rhetoric on Chinese investors is probably what gave him the winning urge during elections. And to go from 0 to 100 km/per hour embracing the Chinese people just doesn’t add up? I am afraid no matter what constructive deals are reached between PF and the Chinese, the Zambian people will always receive them with mixed feelings. And the one and only person to blame is the toothless COBRA. Umwaume, that tells you the caliber of people who come to drop nonsense in here. They did not understand the meaning of the statement. Infact RB would have sold those 15 % shares to the Chinese make no mistake. All that is required is to negotiate for higher stakes and enforce labour laws to make sure that workers are treated decently and as first class citizens. Bravo Simuusa. Job well done. Forget these ignorumuses here apart from Umwaume. Sata is an embarrassment, whether his supporters like it or not. And I’m saying he is an embarrassment not because of what he is doing, but because of what he is NOT doing. He has so far broken 80% of all the promises he made and even worse. You know who has the last laugh here? RB, MMD, and their supporters! In a few coming months, there will be so much money exchanging hands within PF government that they may decide it is not safe to try and investigate RB any further. Don’t joke with money!!! Money killed Jesus Christ. Where is all the tough talk we used to hear from Sata????? Plus now it will be worse because of the extreme low education levels of his Cabinet Ministers. By the way, have you seen how the Kwacha has lost value??? Wait, worse to come! Less money into your pockets !! But the previous governments made errors by going to the East. I thought we were full speed enroute to the West (with a nice kowtowing to the bishop). What has changed mwebantu? Gokigo, I have just been telling off akapuba kanobe ka Mushota on the other blog. Bushe, how do you guys think? Look at the cabinet and say its full of extremely lowly educated people. Just that conclusion puts you in the same arena as ka Mushota as “utupuba”. Prof. Luo, Dr. Phiri, Dr. Simbyakula, Dr. Kasonde, Prof. Wilombe, etc and you call that “extreme low education levels of his Cabinet Ministers”. Awe, walipena boyi. Kabiye ku Chainama. Umuti eko uli. Nabanjeba abanandi especially medicine for late hot afternoon hallucination. In reality by owning 15% of a non-listed Chibuluma South, ZCCM-IH is stuck. It cannot sell those shares on a stock exchange and the majority owners can fool around with the capital in the group and never declare dividends. You have to ask yourself: what is the point of being a minority shareholder (other than sitting allowances for your Zambian director)? A transaction like the Jinchuan one gives an opportunity to monetise the investment and use the money for more production infrastructure development. The Chinese truly have Satan by his short and curlies, and even squashy balls! He has capitulated at the first sign of resistance by the Chinese. The Chinks must now have absolute contempt for this chap knowing that he has no balls to negotiate for better terms for Zambia. What a lost opportunity! The kaponyas must be licking their wounds for wasted votes. Sata ki Masipa, whatever that means but sounds good anyway, the whole point is that the new GRZ is in the process of renegotiating to incease the stakes in the mines. And why not legislate and say 51 % shall be owned by GRZ and whoever wants to invest in the mines should start by negotiating at 49 or less %. So as a move in the right direction, conclude the transanctions amicably and then swiftly move into re-negotiations. Thats what we as PF are doing boyi. GK and Umwaume talking sense. Please read widely. the Chinese bought Metorex Group a few weeks ago. The zambian Chibuluma mine is only a part of the group. The Zambian govt is only one of the shareholders in Chibuluma. As pe Stock Exchange rules, Metorex has the right to ask Zambia to sell them their 15% but they didnt do that. We should commend them for that because they would have owned 100% while ZCCM-IH / we owned zero in the mine. the Chinese have acted wisely considering the political and emotional situation in Zed at the moment regarding mines. There’s nothing Sata and Simuusa have done here. It is simply business and teh Chinese being considerate. #17 GK, that sounds good. In fact China does not allow more than 50% foreign ownership of local firms in their country. However in Zambia, to build up our stake will be expensive as we have to pay for teh extra shares. Somebody has to sell them to us. I wonder how else it can be done. Perhaps in future, for new mines, we can tell investors “Hey guys, we have copper here, bring some capital to dig it out and we will give you 49% of equity or ownership in the company”. We should have done that with Lumwana as it did not exist during ZCCM times. AGONY IS…….voting for Sata with the hope of him sorting out the Chinese,then when he’s in power realising too late that he has been sorted out by the Chinese. Am warning all cadres, say anything stupid and I will come at you. Am all fists this time. Speak nonsense and I will erase your honour. You need to form pacts to comment because you will be so afraid, for I come like that nightmare that you want to wake up from but cannot because you are dreaming within a dream! Daily mail ran an article sometime back which said rebranding Sata was agony unlimited! I just pity those that voted for change. Is it more of the same?? A waiver….??? what change did they vote for my dear. they voted for distruction. that is why we cant work. on maters that require interlectuals we sent Kaunda and Vp. on matters that require insults, we shore up, coz we are good at fighting and insulting others. kaponya fye sata ata bane. GK is the new mmd bootlicker.He is seing nothing wrong with the occurances in plot one. One thing he should know is that, Sata bali musuba ku ma chinese, then, Finance Bank issue was a blunder, his appointments are tribal, his doings are not corresponding with his campaign promises. He is in a situation were a lot of things are happenning at the same time and he cant cope. State house is not City advertisers and requires somebody with brains to equal the task. I think this was a message to all would be Zambian rulers. GK,Umwaume and Ice Road! I like your insights and sensible comments..Actually people do not understand that increasing sharholding means spending alot of money.Its not just by word of mouth or directives.Remember 2.28% of Lumwana shares were sold for US$167m. What of 20% or 30%? Zambia CANT afford.As for the CHIBULUMA shares, as long as you are minority (15%) shareholder, there is nothing you can do apart from watching. Jinchuan can actually buy us off but am sure they have a big heart realiing that this is GRZ investment which can pay dividends to the Zambian Govt and use the funds for developing country. .
#28 First time. Thanks and well said. Consolidations and mergers and acqusitions take place all teh time in all industries and companies change strategies in persuant of growth or survival. Normally, govts only try to ensure that there’s still enough competition in the industry so that consumers are protected from unfair pricing. Often done thru Competition Authorities. In our case teh Zambia Consumer Competition will have interest in the buy out at Chibuluma, e.g how this may impact wages and labour market.